There's still a month before the season begins, and already the Yankees have been able to replace A.J. Burnett's value to the team. No, it's not a WAR-level replacement player. Ha! That's a good joke. I wish I'd thought of it. 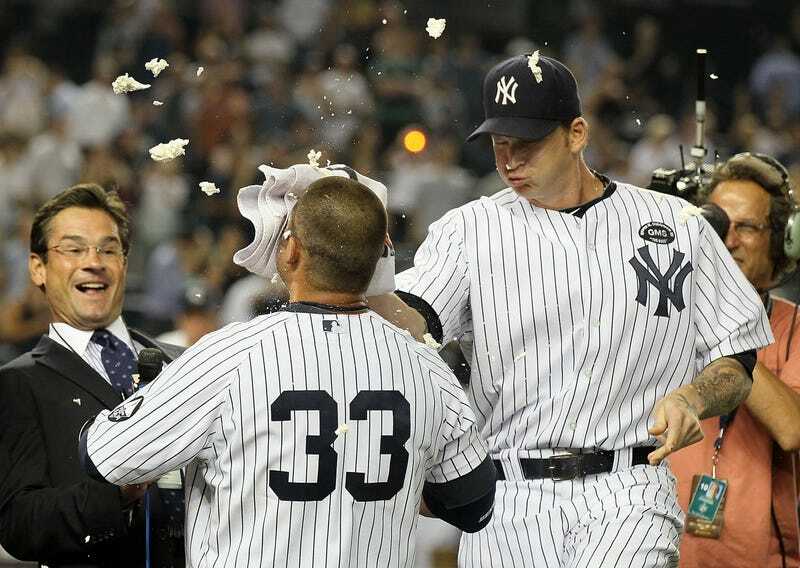 Burnett was the self-appointed piemaster of the 2009-2011 Yankees, greeting whoever was responsible for a walkoff victory with a shaving cream-filled towel to the face. Yes, a storied Yankee tradition, up there with pinstripes, numbers on the uniforms, that legendary facade, and inflated contracts. But with Burnett shipped to Pittsburgh, there was a fear that perhaps this piece of Yankee history would be history. Worry no more! Nick Swisher says he'll happily take over pie duty. "I'm sad to see him go, and wish him the best of luck," Swisher said. "We're going to have to keep something going, man, because people in New York want pie! You know, let's just keep it going." Continuity and a respect for history. That's what you expect as a Yankee fan. And lo, this classic institution will live on as long as Nick Swisher. Which looks like it'll be one more year, since Swisher says he'll try out free agency after the season.